Performers include: Joan Gerber, Chuck McClendon, Susan Dey, Danny Bonaduce, Brian Forster, Suzanne Crough, John Stephenson, Julie McWhirter, and Frank Weller. The members of the family are single-mother Shirley (Joan Gerber), handsome Keith (Chuck McLenan), beautiful and hip Laurie (Susan Dey, later Sherry Alberoni), scheming Danny (Danny Bonaduce), and cute youngsters Chris (Brian Forster) and Tracy (Suzanne Crough). The Partridge Family musical group is managed by bumbling agent Reuben Kincaid (John Stephenson). 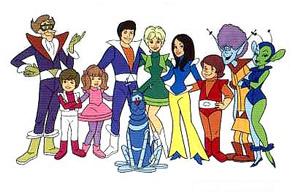 Other regular characters include Keith’s Venusian exchange-student friend Veenie (Frank Welker); Laurie’s perky exchange-student friend Marion Moonglow (Julie McWhirter); and Danny’s robot dog Orbit (Frank Welker). More about: Partridge Family 2200 A.D.